A couple of years back after a lot of research I took the plunge and bought a Flex 1500 Software Defined Radio. This QRP radio is a really fine machine and I enjoy it very much. Although I also like QRP operation there are times, especially on SSB, that a little more power would be nice. WA2EUJ won the ARRL Home Brew contest a while back with a neat little 50W amplifier design. He has since updated the design to include filtering for 80-10 Meters and there is a professionally produced printed circuit board available for this updated version. I've decided to build this amplifier and will be documenting it here as a series of posts. I have the bulk of the parts on order and hope to begin as soon as the bench is cleaned off! Update: January 15, 2012. Several people have asked about where more information can be found on the updated project. Current bill of materials, schematics, etc. 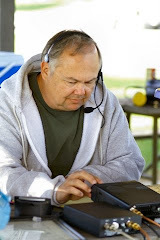 are available on the ARRLHBC Yahoo Group. Several other projects are discussed there as well but the files section is a treasure trove of information about the PC board, tuning, etc.